Catherine Schonauer poses for a photo Friday at the welcome table at SourcePoint’s Enrichment Center. Schonauer leads tours and greets guests from 10 a.m. to noon every Friday. One of the first faces you might see if you take a tour of SourcePoint in Delaware is that of Catherine Schonauer, a Galena woman who volunteers her time to give back to the local senior center as a way of thanking SourcePoint for its Meals on Wheels program. In 2015, Schonauer was working in the human resources department for the State of Ohio’s Opportunities for Disabilities when she developed strep throat. The strep throat developed into pneumonia and then sepsis, and on July 1, 2015, she had to have her hands and feet amputated. Schonauer retired from her job and spent the next six months in rehabilitation. After she returned home, she became a client of SourcePoint’s Meals on Wheels program, which delivered food to her several times during the week, and last year, she began volunteering as a concierge at SourcePoint. Schonauer said giving tours has been great practice on building up stamina and practice on walking with her leg prosthesis. “On stilts it’s… you know,” Schonauer laughed Friday. Schonauer said the prosthesis she currently uses to walk are her fourth pair, but added she recently walked around Tanger Outlets without difficulty. Schonauer said it was important to her to get back out there and help others. In addition to volunteering at SourcePoint, Schonauer is a certified peer visitor through the Amputee Coalition and visits people who have been hospitalized and have to undergo amputations. Schonauer said she also does volunteer work with Columbus-based Optimus Prosthetics. Before her two-hour shift as a concierge Friday, Schonauer added she plans to keep volunteering as much as possible in the future. “Volunteering is important to me because I can’t currently work,” Schonauer said. 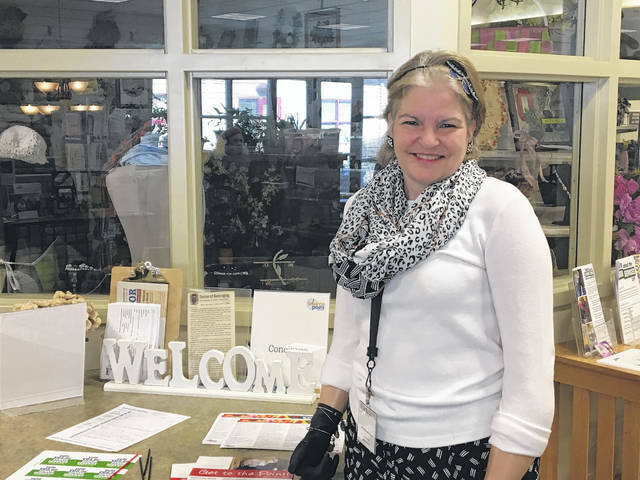 https://www.delgazette.com/wp-content/uploads/sites/40/2018/04/web1_catherine-1.jpgCatherine Schonauer poses for a photo Friday at the welcome table at SourcePoint’s Enrichment Center. Schonauer leads tours and greets guests from 10 a.m. to noon every Friday.